If you are a Federer fan then this is definitely a great choice of tennis racket for you. You will be able to hit amazing volleys and serve basis all day long playing with this back from Wilson. You will love the design quality of this racket, durable build. Since this is made by Wilson and they are the official brand for the US Open so you know you are getting a high-quality product something you can trust in, you don’t have to be afraid to spend your money on this racket at all. It is a great practice racket and it will help you to improve your skills and your technique noticeably when used over time. The Wilson Federer adult tennis racket is great for beginners and intermediate players alike. It is lightweight, sturdy and made from good quality materials. It provides good balance because it is so lightweight, so even for those shots that you have to for you can still stay on your feet and still get that ball across to your opponent. It really just makes for a great racket for some really awesome game play, whether you are practicing trying to be a tennis professional or you are just having some fun on Sunday mornings – you will love this racket. This Wilson Federer adult racket features Arc technology which ensures that it offers great balance and stability which in turn gives you greater control. For comfort you will like the perforated grips which also improved your grip on the racket so you know it will not slip from your hand during game play. There are also stop shock pads which reduce the vibration of the racket when a ball hits it thereby providing you with greater control and more comfortable gameplay. The racket is also made with power strings which improves the power off your strike when sending over the ball to your opponent. This helps you to have a more fulfilling game whether you are playing for fun or playing professionally. The tennis racket has a head size of 106 square inches with 3 points head light strung balance. With longer main strings you will find that the power of the racket is increased immensely. The moisture wicking on the grip area of the racket ensures that it will stay firmly in your hands even if you have trouble with sweaty palms. The grip is also perforated which allows for better airflow and lends to the moisture wicking ability of the grip area to keep your hands cool and dry. The racket is lightweight thanks to AirLite Alloy construction and its weight when strung is a mere 10.4 ounces. The Wilson Federer is the ideal choice for a beginner or an intermediate player who wants to have a professional styled tennis racket. It is a great option as it is well made to professional standards. Featuring Arc technology the racket provides more control and stability than your typical run of the mill racket. It offers perforated grip with moisture wicking to keep your hands cool and dry as you play in even the most intense and fast paced game. The power strings give you the additional power to really drive that ball past your opponent and the stop shock pads keep vibration under control when you are receiving balls. When it comes to tennis rackets for beginners this is one of the few that you will find more professional style features on. Most beginner rackets are just basic rackets but Wilson ensured that this racket would offer a cut above the rest. It is reasonably priced for a racket of its caliber and offers so much more than a number of other beginner rackets. A lot of work has been put into the design of this racket to ensure that it is close to the feel and performance of a professional racket. This is a great idea because a beginner using this racket will more than likely have a greater experience and will do better at the game than someone who first played with an inferior quality racket. The Wilson Federer adult tennis racket is a great option for beginners who are serious about stepping it up in their tennis game. 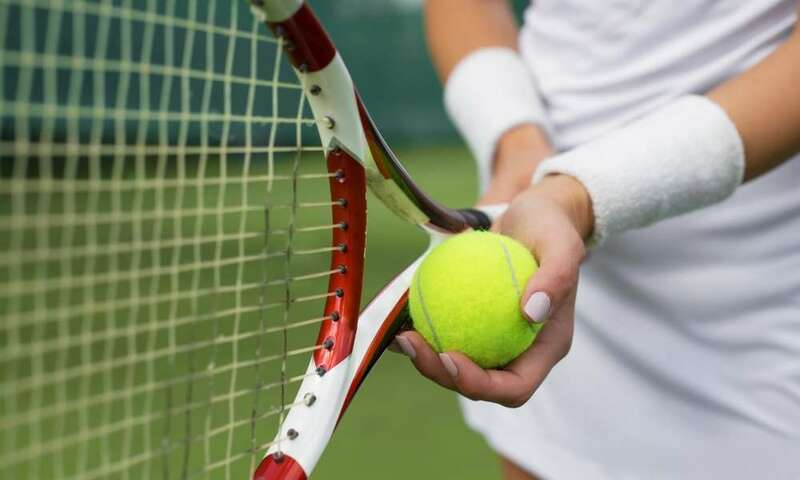 The racket is also a great option for intermediate players who are still feeling their way through the game and who are on a budget and not quite ready to commit to the price of a professional racket. It has a number of the features you only find in higher end rackets and so it makes for a good investment. As such we highly recommend this tennis racket from Wilson – the leading name in the manufacture of tennis equipment.